LEGO Star Wars Ideas Book features imaginative play and building ideas using your own LEGO brick collection, from LEGO projects that take just a few minutes, to builds to keep you occupied for hours. Set up a game of LEGO Star Wars skittles, create a pencil pot shaped like your favourite Sith or Jedi, build a fleet of tiny TIEs, design Darth Vader's family tree, and customise a podracer. Challenge a friend to take on a rathtar, mix up your minifigures, stage your favourite movie battle scene with LEGO Star Wars bricks - and much, much more! 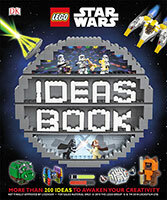 LEGO Star Wars Ideas Book is packed with a family friendly range of activities to inspire every LEGO Star Wars fan. What will you build? 2018 The LEGO Group. & TM 2018 LUCASFILM LTD.Find a galaxy full of LEGO Star Wars ideas to build - from activities and art, games and challenges, to practical makes and your very own inventions! LEGO® DC Comics: Super Heroes: Amazing Battles! Sophie La Girafe: Pop-Up Peekaboo Happy Birthday Sophie! DK Reads: Beginning to Read: Star Wars: Rebels: Rebel Power! DK Reads: Reading Alone: LEGO® Friends: Let's Explore! Sophie La Girafe: Sophie's Big Noisy Book! Sophie La Girafe: Big Beep Beep Book!